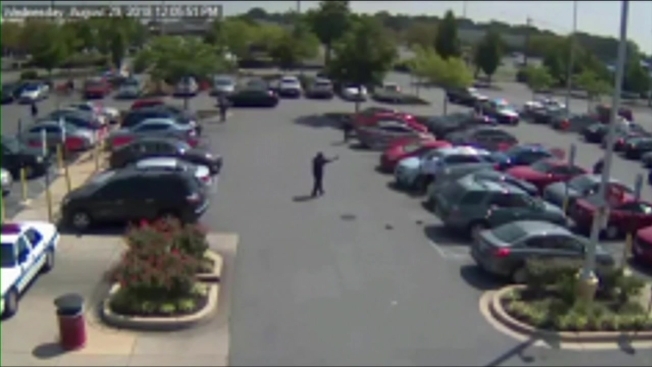 Dramatic surveillance video shows a standoff between a man holding a woman at knifepoint and a security guard before police swarmed the suspect to apprehend him in the parking lot of a Maryland Target store. Curtis Marbury-Green, 26, had just stabbed a man repeatedly inside the store in Forestville about noon Aug. 29 before grabbing the woman, who he was in a relationship with, and taking her outside, police said. 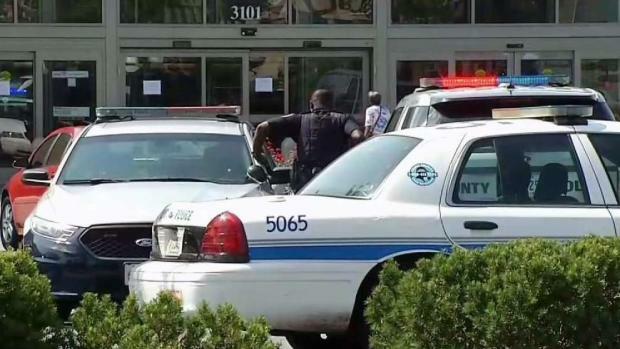 Off-duty Prince George's County Police Officer Irving Estime, who was working as a part-time security guard at the store, pulled his duty weapon on Marbury-Green, who dragged the woman through the parking lot with the knife at her throat, police said. Estime asked Marbury-Green to let the woman go and drop the knife and radioed police with updates. After about two or three minutes, backup arrived and slowly approached Marbury-Green, whom the off-duty officer kept distracted, police said. "We just wanted to try to end the situation safely without anybody being harmed. Just communication was the biggest thing. Making sure I kept contact with him telling him, 'Hey, man. Drop the weapon you don't want to do this,' to let her go, and it helped. It worked," Estime told News4 last week. A suspect stabbed a man multiple times and held a knife to a woman's neck at a Target in Forestville, Maryland. News4's Tracee Wilkins spoke to the officer who helped intervene. Officers used a Taser to subdue Marbury-Green. Several officers then ran into the store to assist the stabbing victim, who was a friend of Marbury-Green. The victim was taken to a hospital in critical condition but is expected to fully recover, police said. "It was very hard. The backdrop, the customers, the people who were all around," Estime said. The reason for the stabbing is under investigation. Marbury-Green is being held without bond on several charges, including two counts of attempted first-degree murder and two counts of first-degree assault.